Catalunya is a semi-autonomous area of Spain; steeped in culture, its traditions and festivals date back over thousands of years. Rich in mediaeval villages, highlights include prosperous Peratallada, peach-coloured Pals and fashionable Begur. The rocky coastline is dotted with pretty fishing villages, crystal clear waters and beautiful beaches which are perfect to explore. This holiday is full of contrasts and variety and explores one of the most beautiful corners of Catalunya. It's gentle cycling too, occasionally off-road, through olive groves, peach orchards and pine forests, and along pretty coastal paths. The landscape is gently rolling for the most part, making this an easy cycle and a relaxing holiday. The changing seasons bring white blossom in spring, sunflower yellow in summer and warm gold at harvest time. Fabulous coastal views, beautiful beaches and aquamarine waters make this an inspirational area. You stay in a variety of hotels, all with pools, which have been hand-picked for their charm and character. The family-run Hotel Garbi in the traditional fishing village of Calella de Palafrugell, is set on the hillside overlooking the sea. 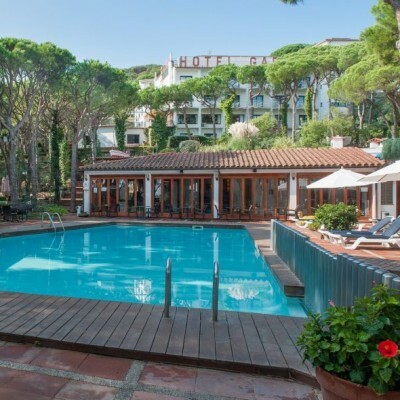 The stylish Hotel Sa Punta in Platja de Pals is set in attractive gardens and is within walking distance of the beach or you can cycle to nearby Begur. 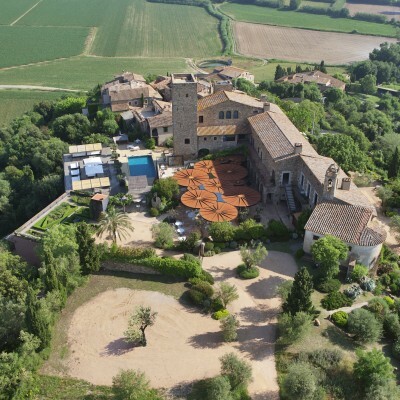 Two nights of the holiday are spent at the Hotel Castell d'Emporda, a magnificently restored C14 castle perched proudly on its outcrop, just outside La Bisbal. The breathtaking views over the plain from its sun terrace are not to be missed. Rideplus is available on this holiday (see daily route options below) and includes additional route directions and GPX files for you to download to your own navigation device. Simply request the Rideplus option at the time of booking. Upgraded bikes are also available, see the dates and prices for further details. Arrive at The Gallery Hotel in cosmopolitan Barcelona, a bustling seaside metropolis offering a fascinating blend between old and new. Spend time discovering the modernistic masterpieces of architect Antoni Gaudi, including the awe inspiring Basilica de Sagrada Familia and the Park Guell. Visit the narrow medieval streets of the Gothic Quarter and La Rambla, a broad tree lined promenade, always jostling with activity. Head out to dinner where you will find cuisine for every taste. 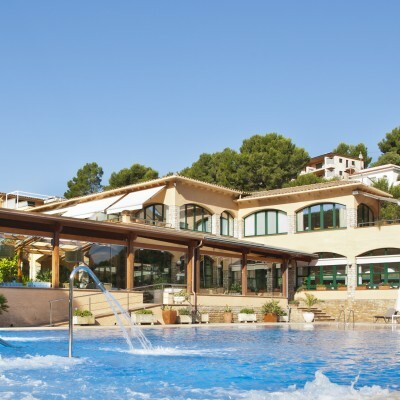 Transfer by train to Calella de Palafrugell and the Hotel Garbi. All Headwater guests are accommodated in rooms with a private balcony and sea view. It's less than 5 minutes' walk to the centre of town where you have so many restaurants to choose from, we've left evening meals up to you. Your route today passes through the pine forests behind Calella before heading off to peach-coloured Pals, a lovely mediaeval town with Romanesque church affording stunning views. After lunch, head on through the pretty hamlets of Palau-Sator (where there has been a settlement since Roman times) and Fontanilles, before looping back towards the coast and a gentle downhill ride to Platja de Pals. We strongly recommend a visit to mediaeval Begur, a fashionable hilltop town with C11 castle and outstanding views over the coast. Alternatively, relax on the beach, follow the superb coastal walking path or simply chill out by the hotel's semi-Olympic pool. You'll begin today cycling past rice fields before following the River Ter to Torroella de Montgri with wonderful views of the Illes Medes. Visit this lovely mediaeval town with its Roman defensive wall before heading inland along wonderfully quiet roads through the village of Gualta (picturesque C16 bridge) and pretty hamlets of Fonolleres, Matajudaica and Casavells to La Bisbal. Here you'll stay in a uniquely converted C14 Gothic castle - once reputed to have been on Dali's shopping list but now owned by Dutchman Albert Diks. Laze by the pool (there's a fabulous sun terrace and bar area) or follow our suggested cycling circuit linking the pretty mediaeval villages of Corca, Monells (pretty square and lovely choices for lunch) and La Bisbal, a lively market town famous for antiques and pottery. Take time to explore the old quarter including the Carrer del Call, formerly a Jewish ghetto, whose intricate arches are still intact today. Today offers lovely gentle cycling, stopping first at the walled village of Ullastret. The vast archaeological site here contains the remains of one of the oldest Iberian villages in Spain. Continue your journey through beautifully preserved Peratallada to the bustling market town of Palafrugell. Then back to Calella de Palafrugell for a final swim in the pool. Please note that cycling helmets are a legal requirement in Spain. As we cannot provide these, we strongly recommend you bring your own. Please see our Planning your holiday page for full details. During your holiday you stay at the following hotels. If you'd like to extend your time at any of these or, if you'd like to enhance your stay with an upgraded room, just let us know at the time of booking. If you'd like to keep your bikes with you for any extra nights we can arrange this for you for just £25 per adult per day and £18 per child per day. 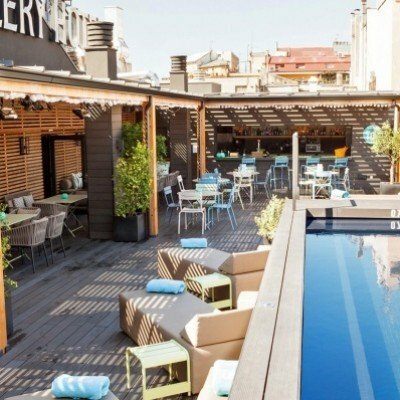 Located in the centre of Barcelona, the Gallery Hotel has 25 years of experience to take care of you during your stay. The rooms are bright and have lots of home comforts included. The hotel also boasts a roof top pool and garden terrace. The Hotel Garbi is located on the hillside overlooking the fishing village of Calella de Palafrugell with its own extensive gardens, shaded by pines. The Hotel is family-run and has a warm welcoming atmosphere where its friendly staff will do their utmost to ensure your stay is as comfortable as possible. The hotel also has a car park-for anyone who would like to drive to this hotel. Room upgrades: Duplex Superior Room. The Hotel Sa Punta, just a five minute walk to the beach is set in beautiful grounds with a lovely terrace area for afternoon drinks. There is also a semi-olympic size swimming pool with spa pool. Rooms are spacious and modern with balcony or terrace. Evening meals are taken either in the hotel restaurant or on the terrace. Room upgrades: Superior Room or Suite. Superior rooms are larger in size and have a pool view. Suites are larger still with a sitting area and large terraces and sea views. The Castell d'Emporda could not be in a better location, perched on a rocky outcrop with breathtaking views from its sun terrace. The building is a superbly restored 700-year-old castle, that is now owned by Albert and Margo, who are both very friendly and speak excellent English. Each of the hotel rooms has been individually decorated by furniture collected by the owners while they were on their travels around China, India and Morocco. All of the rooms have spectacular hill-top views, featuring air conditioning and heating, fully equipped bathroom, flat-screen TV, in-room CD/DVD player, telephone and mini bar. Room upgrades: Castle Room, Garden Suite or Suite Pere Margarit. Castle rooms: housed in the original castle building making for a romantic stay. Garden suites: larger than the standard garden rooms (53 sq. metres) and have a separate sitting area. Both the bedroom and the bathroom have balconies! Suite Pere Margarit: (80 sq. metres) was originally the master bedchamber of the mediaeval castle. 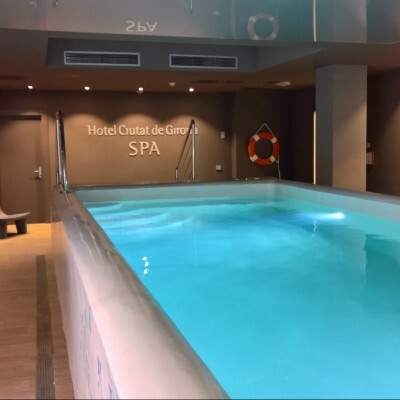 The Hotel Ciutat de Girona is located in the historic centre and beating heart of Girona and is just a 10 minute walk from the train station. The hotel has been decorated with iconic images of Girona's past, the historic pictures sit well with the modern decor of the hotel. The hotel has an indoor pool and an indoor cycling area. You are welcomed with a glass of the local moscatell. The restaurant of the hotel if you decide to eat there prides itself on serving food using local products all of which come from a 62.1 mile radius. On day 1 you should make your own way from Barcelona airport to the Gallery Hotel Barcelona, a taxi rank can be found just outside the arrivals hall and you should expect to pay around €35 - €45 for the journey. On day 2 of your holiday transfer is included from Girona train station at 16:18 (16:58 on Saturdays), and back to Girona train station at 11:45. Every two days from 28th Apr 2019 to 27th Oct 2019, for 7 nights. All dates are subject to availability, please contact us to check. It is possible to hire tandem bikes for this holiday at a supplement of £50 per bike. As these are available on a first come first served basis, we recommend early booking to avoid disappointment. Customers wishing to include the free RidePlus option should request this at the time of booking. RidePlus holidays include additional route directions as GPX files for you to download to your own navigation device. Not all RidePlus routes are suitable for our standard hybrid bikes so you may need to bring your own road bike or hire one - please call for details. Road bikes (Scott Addict) are available at a supplement of £120 per person. As these are available on a first come first served basis, we recommend early booking to avoid disappointment. No departures between August 5 and August 23 inclusive. This holiday can also be reduced to a 4 night version just deduct £235 per adult. When should we contact you ASAP --- ---Tomorrow 9am - 1pm Tomorrow 1pm - 5pm Tomorrow 5pm - 6:30pm ---Saturday 9am - 1pm Saturday 1pm - 3:30pm ---Monday 9am - 1pm Monday 1pm - 5pm Monday 5pm - 7:30pm ---Tuesday 9am - 1pm Tuesday 1pm - 5pm Tuesday 5pm - 7:30pm ---Please reply by email We can call you when it's most convenient for you, or contact you by email if you'd prefer. During busy periods we cannot always guarantee a specific call time but we promise to try our very best.